(JNS) “Israeli Apartheid Week” is an annual event on many college campuses when radical activists chant Hamas slogans, equate Zionism with colonialism, screen propaganda films against the Jewish state and shout invective about Israelis into microphones. At Brooklyn College in New York, a flyer for the event was circulated by Students for Justice in Palestine (SJP) that suggests the entire Jewish state lacks legitimacy: “Come check out our recreation of the apartheid wall set up by settler-state Israel between occupied Palestine and current Palestinian territories,” the flyer says. “Note carefully the words in the flyer,” says CAMERA Fellow Aliyah Jacobson, who is a member of the CAMERA on Campus-supported group Bulldogs for Israel at Brooklyn College. “This isn’t about creating a Palestinian state; it’s about abolishing the Jewish state. 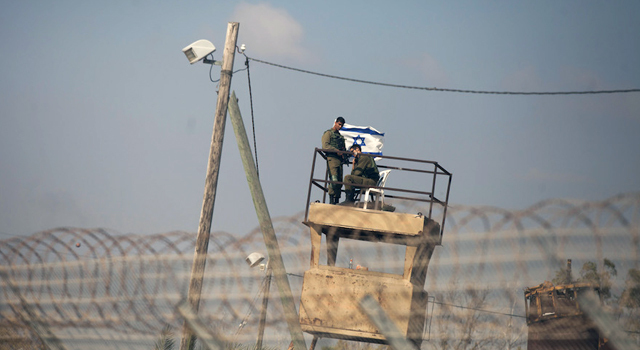 It assumes the whole land is occupied, which suggests Israel shouldn’t exist at all. … What SJP’s really calling for is the elimination of a 70-year-old member country of the United Nations,” said Jacobson. “Given the previous oppression and ethnic cleansing of Jews in the Middle East, and the likelihood this repression would recur, SJP’s message is truly an appalling political position, all hidden beneath the rhetoric of human rights,” she said. To combat SJP’s anti-Israel campaign, Jacobson’s group held a counter protest on April 2. “I would never seek to limit free speech or silence another group, but when their speech is filled with falsehood, I must respond. Free speech is appropriate, but calls for violent intifada aren’t OK, and they can’t be the only voices heard,” she said. With CAMERA’s educational materials, Jacobson’s group set up a table and got vocal so that their voices were heard, too. “Seeing their passion,” said CAMERA campus coordinator Ben Suster, “we overnighted billboards, flyers and panels to them to help. 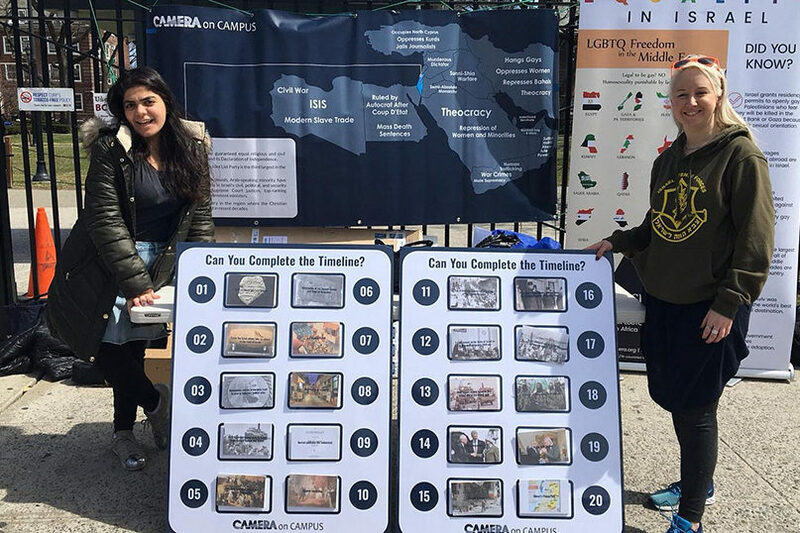 Our materials made sure to highlight Israel actual record compared to Hamas and other authoritarian Middle Eastern regimes.” Jacobson and her group then displayed the materials in front of the “Students for Justice in Palestine” display. They spoke with students, answered questions and objected to misinformation. Pro-Israel students at Brooklyn College work to combat false allegations against the Jewish state that are at the core of “Israeli Apartheid Week.” Credit: CAMERA. Mideast Christians only safe in Israel, priest tells U.N.